Whether you do it for religious reasons or because you just like to go with the flow, many of us don’t mind giving up meat around this time of year because of a glorious tradition – fish fry Friday! 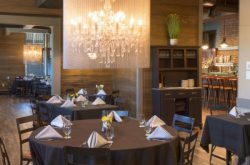 It’s possible that you already have your go-to fish fry joint, but if you’re open to trying out some new places, keep reading. 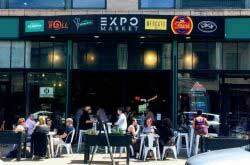 After all, this is an opportunity to really get to know the fish fries of WNY, and decide for yourself who serves the best one. In the name of research I’ve gone ahead and volunteered myself to try a bunch and report back – one for each Friday of lent. 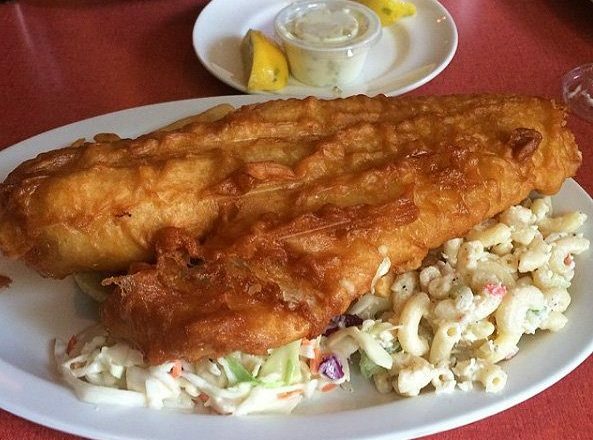 These guys have been around the block, serving up their haddock beer battered fish fry with sides of coleslaw, flavorful macaroni salad, and bread and butter for $13.95. 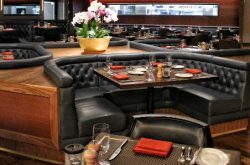 For an appetizer try the French Onion Soup or their specialty -Deep Fried Asparagus. They’re kindof unreal. At Hamlin House, it feels like you’re enjoying dinner in your friend’s beautiful house, and we love it. For a full rundown, check out our full review of Hamlin House from last year. Wiechec’s, where the fish is so big it’s practically hanging off the plate! It comes out beer battered and super crispy with piles of fries, coleslaw, macaroni salad, potato salad and bread for just $12.95. Not a bad deal if you ask me! If you have any doubts, know that this one comes highly recommended by locals. NYBP offers three smaller pieces of fresh, beer battered Atlantic cod. The beauty of three separate pieces is the fact that you get more crunchy fried ends on your plate. This comes with fries and probably the most unique side you’ll ever find – a flight of NYBP beers. 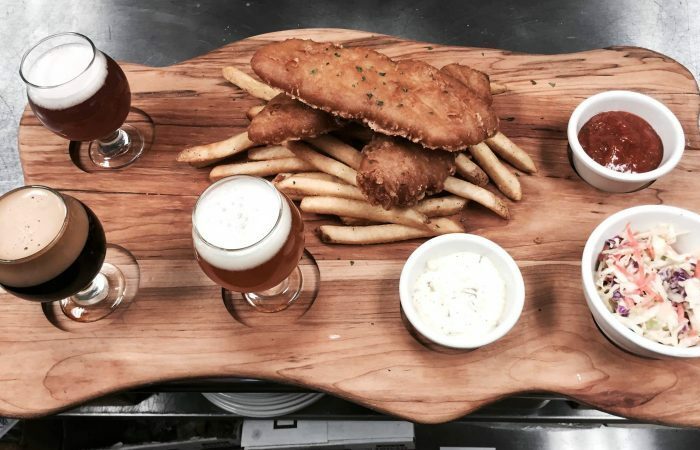 The flight consists of three 5 ounce portions of the brewery’s Lockport Lager, GameDay, and Destination IPA, which pairs perfectly with the fish dinner. The whole shebang is just $14, but if you want to skip the beer you can get it for $12. We can’t thank you enough for this opportunity New York Beer Project. The Icelandic cod at Parker’s is smothered in their *top secret* batter recipe and served with fresh fries for $13. 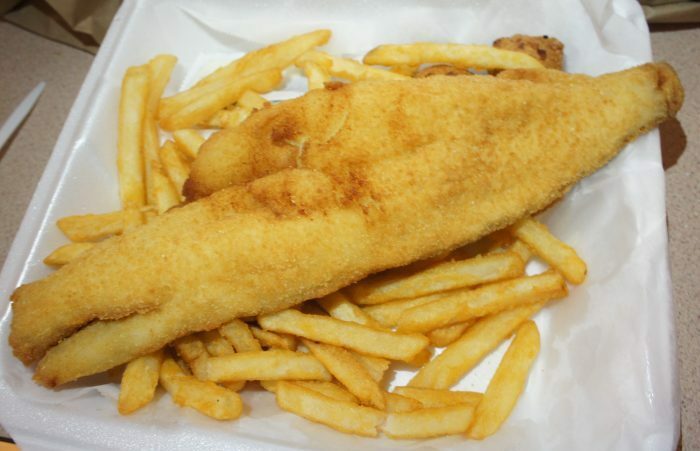 Be warned – fish fry is an American thing, so you probs don’t want to use that terminology here. Also, they don’t serve typical fish fry accouterments like tarter sauce. 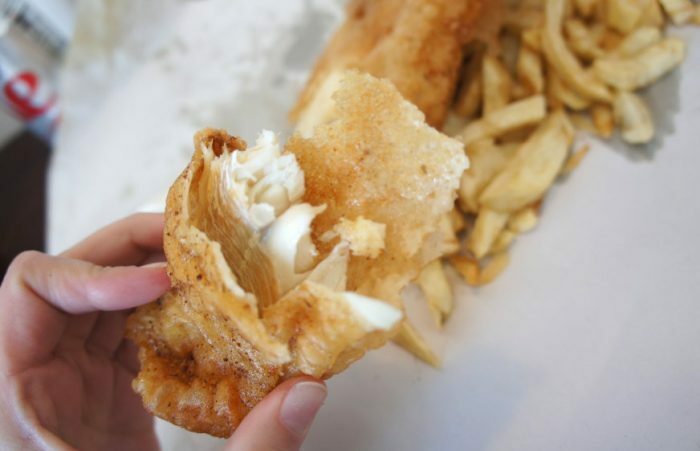 In addition to their authentic UK fish and chips, they offer meat pies and a very interesting “Battered Sausage and Chips” made with handmade British sausage deep-fried until crispy. Say whaaaaaat? 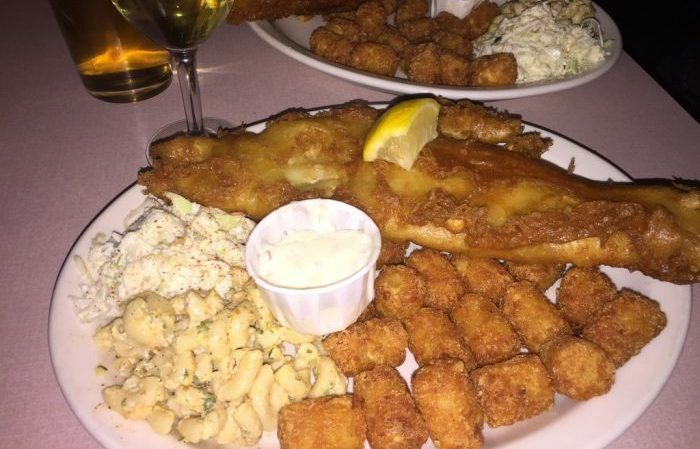 The Crow’s Nest Tavern fish fry dinners are made with fresh cod and served with homemade sides including coleslaw, crab macaroni salad (um, hell yeah!) and your choice of German potato salad or fries for $12. If you’re not into fish fry, they have fried oyster baskets, clam baskets, crab cake combos, scallop dinners, and more. You’re welcome. 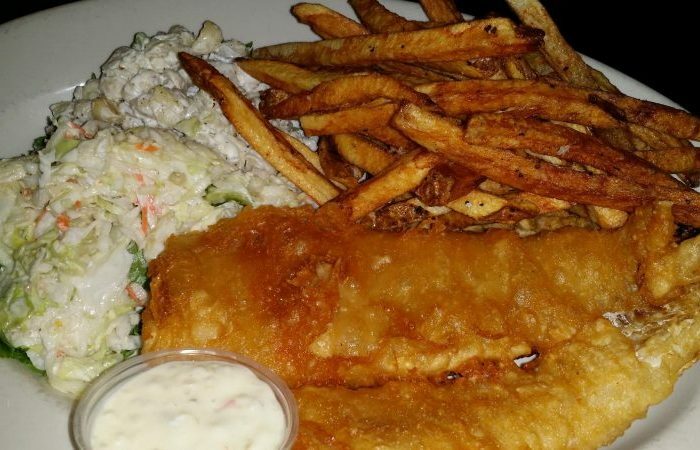 Fish fry Fridays at Curry’s include a large beer batter fish fry served with coleslaw, macaroni salad, your choice of either French fries, rice, baked potato, or German potato salad (Friday’s only), and some rye bread for $12.50. Fish sandwiches are also available served on a roll with lettuce and plump tomato and your choice of fries, coleslaw, or macaroni salad for $9.50 – a nice alternative if you ask me. 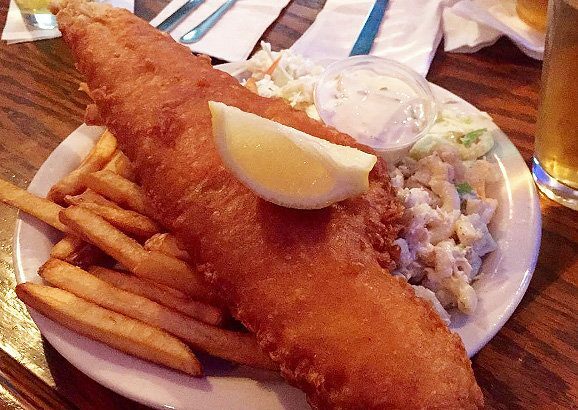 On Fridays the Ale House serves up a gargantuan serving of haddock, beer battered until crispy served with potato salad, macaroni salad, coleslaw, and French fries for $13.49. 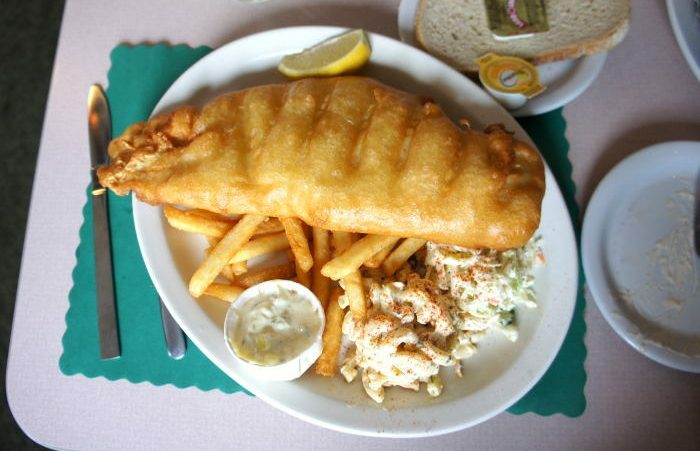 OR throw that giant fish fry on a bun, served with all the sides for just $11.49. A usual hangout for anyone who often finds themselves starving and looking for a yummy meal at a reasonable price, Brewpub has a whole bunch of classics on their menu (read: chicken wing dip, pizza, burgers, wings), plus they serve their Icelandic haddock beer battered fish fry served with coleslaw, mac salad, and your choice of fries or potato salad every. damn. day. Pro tip, their fries are great, but go for the potato salad! 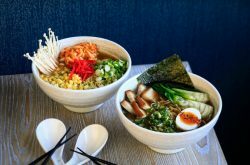 Grab a regular portion for $13.39 or a small for $9.89. Sidelines’ fish fry is served daily with a hefty portion of beer battered haddock served with mac salad, coleslaw, hand cut fries, fresh lemon, and a side of tartar sauce for $12.99. I suggest sharing a serving of the stuffed banana peppers loaded with 4 different cheeses and bread crumbs for a crispy finish. Before serving, they top the peppers with a sweet basil marinara sauce and serve them over toasted garlic bread. Boom. When I first saw the menu for Bailey Seafood, I was seriously intrigued. 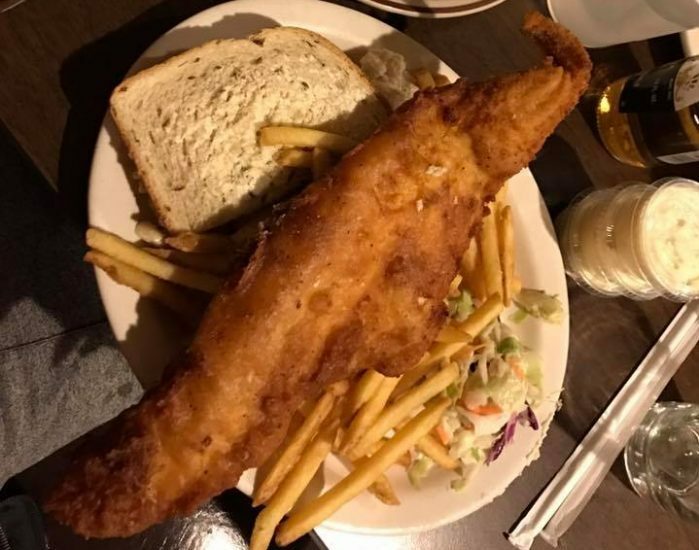 It includes some “normal” stuff like clam strips and fish sandwiches, but beyond that, the menu far exceeds the items you’re used to seeing at the average pub. FYI this is not a pub. 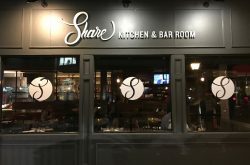 It’s more of a fast food fish eatery meets fish shop, with to-go menu items like buttermilk battered oysters, frog legs, deviled crab in the shell, hand breaded smelts, okra, crawfish, and catfish just to name a few. If you’re in the mood for fish and fish only, they serve fried fish by the piece for a very reasonable price, which includes a whole catfish for $6.49, perch for $3.39, haddock for $5.49, red snapper for $5.79 and everything else in between. They even offer free items when you spend a certain amount. For example, you get a free slice of sweet potato pie with a $20 purchase, a free serving of their homemade tartar sauce with a $25 purchase or a free serving of their hand breaded okra with a $25 purchase. 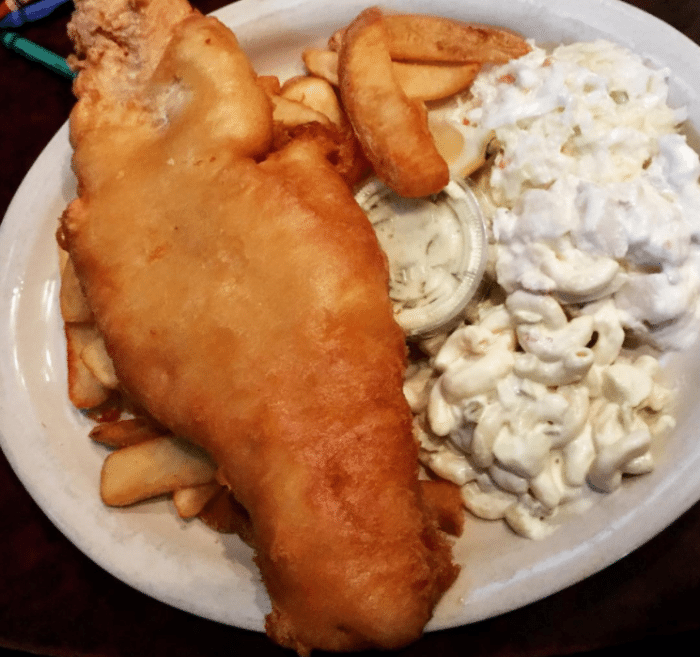 Grab one of their classic fish dinners served with homemade coleslaw, tartar sauce (theirs is to die for), and hush puppies for $8.49 with combos available if you’d like a few added items. Just remember this is a takeout place. You can even place your order online here so you can scoop it up on your way home from work. Brilliant!